Chrysler Group announces it has repaid $7.6 billion US it got in bailout loans from the Canadian and U.S. governments after it filed for bankruptcy in 2009. Chrysler Group has repaid $7.6 billion US in bailout loans and interest it got from the Canadian and U.S. governments after it filed for bankruptcy in 2009, the company announced Tuesday. The automaker said it has completed payments of $1.7 billion to the governments of Canada and Ontario and $5.9 billion to the U.S. Treasury. 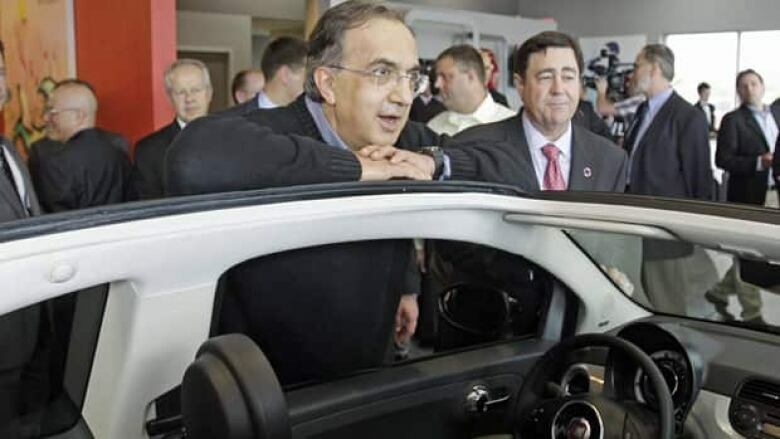 "Less than two years ago, we made a commitment to repay the U.S. and Canadian taxpayers in full and today we made good on that promise," Chrysler and Fiat CEO Sergio Marchionne said in a statement. Finance minister Jim Flaherty congratulated Chrysler. "We remain committed to exiting from ownership of Chrysler as quickly as feasible, while maximizing the value of our equity interests for Canadian taxpayers," Flaherty said in a release. In total, Chrysler paid the goverments $8.5 billion since it took out the loans, which includes $1.8 billion in interest and "additional considerations." It originally borrowed $5.1 billion from the U.S. Treasury Department and $1.6 billion from Export Development Canada, a federal agency. The payments Tuesday include the initial loans plus interest. The governments still own equity in the company, although they have indicated they plan to sell it at some point. "Compared with 2009, when Chrysler went into bankruptcy and many people skeptical about its future and very skeptical about the government providing money to Chrysler," Tony Faria, Professor of Marketing at the University of Windsor's Odette School of Business, told CBC, "things have completely turned around now and it looks good for Chrysler." The move opened the way for Italy's Fiat to increase its stake in the U.S. automaker. Part of the repayment money came from Fiat, which exercised a $1.3 billion equity call option to buy another 16 per cent (fully diluted) stake, Chrysler said. The repayment means Fiat's ownership of Chrysler will rise to 46 per cent. The rest of the money Chrysler repaid to the governments was raised from a term loan and bonds. Chrysler was originally given until 2017 to repay, but CEO Sergio Marchionne said Monday that Chrysler can replace the loans with borrowing at cheaper rates from large institutions such as pension funds, something that will save it $350 million annually in interest. The U.S. government will still own a small share of Chrysler, which the company can buy over time. Ontario and Canada together own 1.66 per cent of Chrysler, with Ottawa holding two-thirds of the stake, a federal spokesman said. Fiat and the U.S. Treasury Department have worked out an arrangement that allows it to increase its stake in Chrysler to as much as 76 per cent over time.